Home EU News The government of Hungary begins their counter offensive against open-border activist George Soros. * Hungary: The government of Hungary begins their counter offensive against open-border activist George Soros. Viktor Orban possesses great vision and instincts. Instead of allowing the Soros Network to control events in Hungary, Orban has once again taken strong preventive action to control those who wish to destabilize his nation. • The V4 Report would like to thank one of our readers from Hungary, Gabor Toth, for providing us with this link. 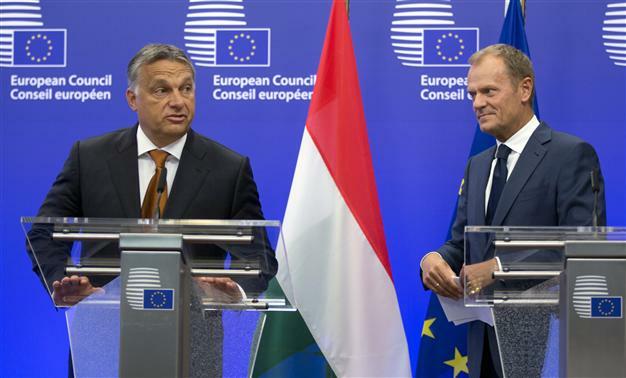 ** The media will attempt to portray this as a ploy by Orban to drum up support for Hungary’s national election. However, this is pure nonsense. First, this is not a new position. Orban has been a consistent opponent of migration since the fall of 2015. Second, Orban already enjoys broad support. His lead is so wide that he barely mentions his rivals. Instead, he has focused his battle on defending Hungary from the aggressive meddling of Brussels, Paris and Berlin. Orban realizes his “fiercest opponents are not in Hungarian opposition parties” but “from abroad”. *** In its latest “national consultation” shortly to be dispatched to citizens, the Fidesz-led government has formulated seven statements pertaining to the so-called “Soros Plan” for resettlement of migrants in Europe. 1. George Soros wants to encourage Brussels to settle at least one million immigrants from Africa and the Middle East annually on the territory of the European Union, and thus in Hungary too. 2. George Soros, together with leaders in Brussels, also plans for the EU member states, including Hungary, to dismantle the border protection fences and open the borders to immigrants. 3. Part of the Soros Plan is for Brussels to forcibly distribute the immigrants gathered in West European countries, with particular regard to the countries of Eastern Europe. Hungary, too, would have to participate in this. 4. Based on the Soros Plan, Brussels would have to oblige every member state, including Hungary, to pay HUF 9 million in state aid to each immigrant. 5. George Soros also wants migrants to receive lighter punishments for crimes they have committed. 6. The goal of the Soros Plan is for the languages and cultures of European countries to be pushed into the background in order to ensure the more rapid integration of illegal immigrants. 7. Part of the Soros Plan is to launch political attacks against countries that oppose immigration, and to impose heavy penalties on these countries. The battle has begun and Viktor Orban has answered the bell. *Game On! * “Game On” is a term often used to describe the emotional atmosphere at the beginning of an intense sporting match between two bitter rivals.